South Carolina had a fair number of Irish in the 19th century, and most of them seem to have been immigrants of the famine period because by 1910 there were fewer than 700 Irish–born left. Although O’Dea mentions a Charleston division that joined the Confederate Army en masse in 1861, the post civil war division was not formed until November 2, 1889. This division held its first annual ball in 1891 and by 1892 had enrolled 100 members. A second division was organized in 1893 and a third a year later, all in the city of Charleston. The Charleston Hibernians met in the hall of the Irish Volunteers, an old and prestigious society founded in 1801, and a close connection existed between the organizations, since the AOH entertainments were held in their hall as well. Activities in the 1890’s included a parade on St. Patrick’s Day, a yearly picnic for all the divisions, and various balls and receptions. The South Carolina AOH owed a lot to the fact that P. J. O’Connor of nearby Savannah, Georgia was the national delegate (president) of the Order. A Charleston reception in 1894 was hosted by the three AOH divisions in honor of O’Connor, who was to be asked to visit again on many subsequent occasions. The last division to be founded, No. 3, went from 100 members to 147 by the close of 1894. As far as can be determined, only the Charleston divisions ever sent a representative to a National convention, but the Order was organized in at least one other town in that state. Unfortunately, its location has not yet been discovered. The strength of the society dropped off rapidly, falling below 100 members in two divisions in 1910, and vanishing completely during World War I. 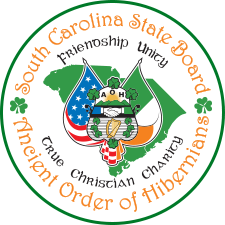 According to known history, the Ancient Order Of Hibernians had a presence in South Carolina as early as 1861, when a Charleston division joined the Confederate Army en masse. The first post Civil War division was not formed until November 1882 and by 1889 had over 100 members. A second division was chartered in 1893 and a third a year later, all in the city of Charleston. There is history showing at least three divisions in the Charleston area in 1903. In modern times, Myrtle Beach formed its division in 1996 followed by Charleston. After the third division was formed in Columbia, it was decided that a State Board would be formed. On February 22, 1998 the South Carolina State Board was installed. Very soon after the State Board was formed, the Greenville Division # 1 was installed. As the catholic faith spreads throughout South Carolina the AOH has begun to spread. Divisions in Beaufort, York and Dorchester counties have been established.